If you’ve been paying attention, you’ve surely noticed the wonderful new gourmet flatbreads we added to the menu. We have a different flatbread flavour available each day of the week, but the general consensus is that they’re all pretty delicious. The interesting thing about flatbread recipes is, you can pretty much do whatever you want. The flatbread dough is so versatile, it allows you to create whatever wild concoction your heart (and stomach) desires. We’ve had a lot of fun creating our signature gourmet flatbreads - we’ve experimented with different toppings, sauces, and seasonings, finally settling on some incredibly tasty dishes. But the world is a big place, and at this point in time, there’s a flatbread recipe for everyone and everything. If you’ve thought it, it’s probably been done. Join us as we take you through some crazy flatbread flavours we came across while perusing the web. Let us know which of these flatbreads you think looks the tastiest! Flatbreads aren’t just about imitating pizza, which most of our own gourmet flatbreads emulate. You can change the entire flavour notes of a flatbread by selecting vastly different toppings. Dessert flatbreads are a wondrous creation in themselves - nothing can truly compare, although they sit somewhere in between crepes and dessert pizza. This flatbread recipe is done on the grill, and topped with sweetened blueberries, cream cheese, and a light seasoning of honey. It looks great - but then again, you can’t go wrong with blueberries! This delectable creation is made on naan bread, which unlike our own flatbread dough, is leavened (allowing it to rise). It’s spread with chocolate sauce, and topped with mini marshmallows and graham crackers. Close your eyes and be transported back to summer - a fire-ban free summer, of course! If you have a soft spot for spicy foods, you’d have no problem scarfing down these “hot” dishes! We even experimented with spice ourselves, and you can see that in the Buffalo Chicken Flatbread we offer on Wednesdays. Let’s take a look at some of the Internet’s crazy spicy flatbreads. Now this is an interesting flatbread! This recipe calls for Lebanese flatbread (a thin bread similar to pita), and lamb itself is an important Middle Eastern meat. 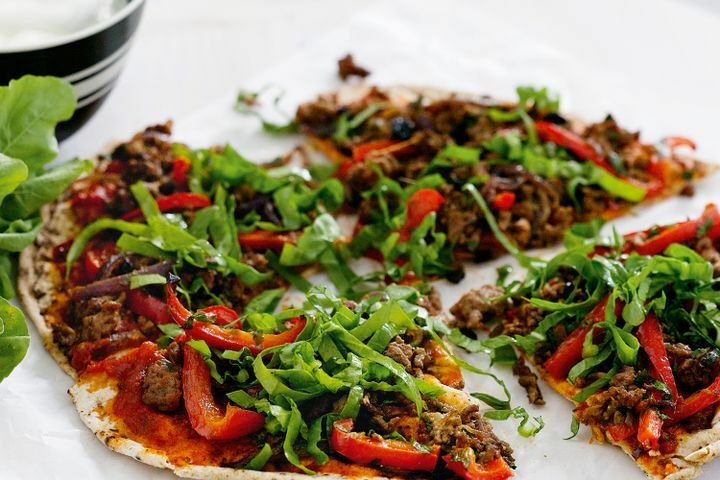 This flatbread is made with tomato paste, minced lamb, parsley, peppers, and a plethora of ground spices. Yum! Bulgogi is a Korean BBQ beef that literally translates to “fire meat.” To all the spice lovers, does this sound enticing yet? This recipe is made up of grilled meat, zucchinis, bell peppers, and kale. These ingredients are then placed onto the grilled flatbread, along with kimchi (a spicy vegetable dish) and topped off with cheese. The making of flatbreads is an art form. It’s not just about balancing the notes of flavour and textures - a big part of these dishes is how attractive they look. With the variety of colourful fruits and vegetables available, it’s not difficult to make them look just as good as they taste. This flatbread has a wonderful pop of colour thanks to the beet-infused hummus spread. The dough is cooked in the oven, spread with the homemade hummus mix (tahini, garlic, olive oil, chickpeas, and beets) and topped with chickpeas and other colourful veggies of your choosing. This colourful concoction sure is eye-catching! The flatbread is spread with tomato sauce, cheese, and then covered with a rainbow array of vegetables. Beautiful and healthy!